This is the first of two guest posts by sopranos Suzanne Vinnik and Sara Duchovnay. 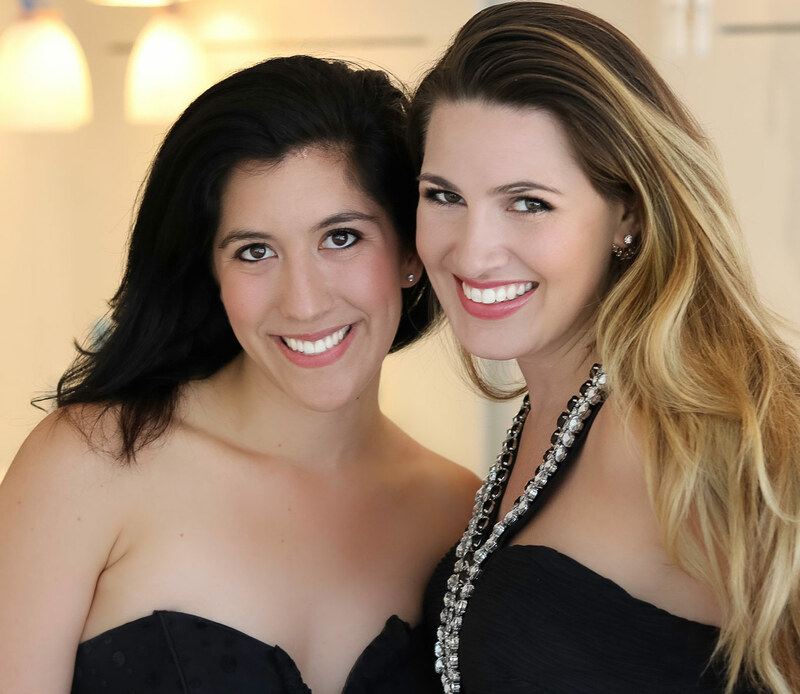 Vinnik is also the founder of Shoperatic (formerly known as the Opera Diva Dress Collection) a community where singers can buy and rent concert wear, including some of Duchovnay’s own merchandise. With audition season fast approaching, Vinnik and Duchovnay address the idea of “rules” governing wardrobe choices for opera singers; with nearly 10,000 followers, the time has come to #freetheknee and rally for change within the industry. How many of us have been given these “rules” for audition wear? Don’t wear patterns, florals, stripes or colorful shoes (they will only distract from your face and your voice). Wear a color (but OH GOD, don’t wear THAT color). Here are a list of colors that are acceptable…they are most likely jewel-toned. Make sure you’re wearing nylons or stockings (no one wants to see your legs). Don’t wear your makeup like that. Today, you shouldn’t have to worry about exposing your “head, shoulders, knees and toes…knees and toes!” You are a human being and it’s highly likely you have those body parts. Your body is your instrument. You have trained it over many years of continuous and rigorous education. It allows you to create beautiful music and transport your audiences to wonderful places, embody varied and exciting characters and traverse time. You form beautiful phrases and make musical choices that are unique to you and you alone. You have style and taste and opinions. You are a self-employed entrepreneur and make choices every day regarding your personal brand and the course of your career. Of course, you take into account the wisdom of your coaches, teachers, conductors, agent, etc., but at the end of the day, you are the one standing on stage. l-r: Sara Duchovnay and Suzanne Vinnik. If you view fashion and the way you dress as an extension of your artistic personality, why would you allow others to put you in a box and stifle you? After all, isn’t your goal to show the audition panel exactly who you are and what makes you special and unique? Carefully evaluate what works for YOUR BODY and YOUR PERSONALITY, and wear what makes your looks and feel your absolute best. Before your voice teacher, mentor, agent, or potential employer has a coronary thinking we are telling you to go out and buy some daisy dukes and crop top for your next audition, we implore them to hear us out. We know that you and every woman has the potential to look incredible, captivating, unique, beautiful, and stylish. We happen to believe that in order to achieve that, archaic rules for audition and performance wear need to be broken (or at least bent). We encourage everyone to dress in a way that is classy and sets a professional tone. One of the most important factors in achieving this is prioritize fit. This might mean that you’ll need to visit a tailor to modify off the rack clothing to fit your unique and beautiful body. Maintain your wardrobe by keeping it clean and free of wrinkles, and practice good hygiene. Keep your mind, body and soul healthy, as they are a major part of your instrument. When buying, renting or selecting your wardrobe, consider the scale of your venue and any obstacles you might come across. If you don’t know the venue personally, ask questions and use your best judgement to evaluate what you are stepping into. Is there a stage? Is it raked? Are you above or below the audience? Do you know anything about the lighting? What season is it? You don’t want to wear a summer dress in the winter or vice versa. What roles are you auditioning for and what is the “vibe” of the company? Do they usually produce traditional period productions, or are they known for their edgier work? With all of that information in mind, make the best choice for you. Let the people for whom you are auditioning know that you are an artist who knows herself and has something unique to say. Thie Opera Diva Dress Collection, founded by Suzanne Vinnik. Vow to not allow anyone to shame or make you feel anything less than 100%. If the jewel-tone jersey wrap dress or satin shiny dress embodies your personal style and makes you feel fantastic, by all means WEAR IT! If covering your “head, shoulders, knees and/or toes” makes you feel comfortable or fits your unique aesthetic…COVER THEM! If you want to wear pants because they make you feel amazing, WEAR THEM! It’s the 21st century and fashionable women like yourself have been wearing pants for over eighty years. Winter is cold, PUT YOUR PANTS ON! Don’t be afraid to trust and follow your instincts, and to say “NO” to the fear of wearing the things you love. Never put anything on your body that makes you feel anything less than powerful, energized, excited, magnetic and transformative as an artist (unless it’s a costume and you are getting paid to wear it). Our personal experiences, and the experiences of so many artists who we love and admire, say that you’ll present your best performances when you are prepared musically, theatrically and emotionally.